Before we talk about kotatsu table, why one must buy it and what are the benefits of having kotatsu at home, let’s take a look at the basic information about kotatsu and how does this stylish, comfortable and easy to move table become popular all around the world. I have come to know about kotatsu when I visit the Japan 5 year ago. Since that, I start searching the kotatsu table in America and finally found a big collection of kotatsu table and related furniture online. 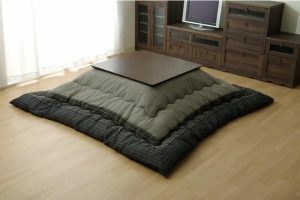 There are very few online store from where you can buy the kotatsu table. A picture of kotatsu cannot really describe the comfort and easiness you get once you have one at your office, bedroom or even in the living room. So, let’s see that what is kotatsu and why it is getting popular all around the world, especially in America? kotatsu is a wooden table which discovered in Japan. As compare to the regular table, this table is made from a low wooden table frame. The whole table is cover with a blanket or futon etc. There is a heat source underneath the table. 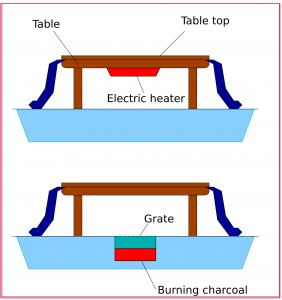 In past charcoal, a brazier was used as a heat source but today an electric heater has been built into the table itself. This means that when you buy a kotatsu you will get the attached electric heater under the table as a source to provide heat. But this is not really necessary as you always have the option to choose that what you like to include in your product; just a simple kotatsu table, a heavy blanket or heater too etc. All depends on your need. By the look, a kotatsu may look like the part of furniture (as table included) but kotatsu is as a heating panel or heating device not part of furniture. So, do not get confuse when someone says kotatsu table or kotatsu heater as they both represent the same thing. What’s includs in the kotatsu? A typical kotatsu is include into three parts; heater, table and futon (or heavy blanket). All three makes a very comfortable, cozy and warm area for people to sit under. The purpose of using a futon or heavy blanket is to keep the area warm and cozy. You can use this table to place your important things, play games or use just to sit on the top as it is equally cozy as it is warm under the table. Usually, the things invented in Japan or China has a very long history but kotatsu does not. The idea of kotatsu came from the charcoal powered hearth which can be found in every household in Japan in the 14th century. This was called irori. Irori was the primary place of the house where people heat and cook their food. Later this irori has been advanced by adding wooden table frame and blanket on the top. This has been called horigotatsu. The purpose of adding a wooden frame and blanket was to create a separate space for people to sit from the fire and cooking area. In 17th and 20th centuries, the source of heating has been replaced from charcoal brazier to electric heaters. Today’s kotatsu, the heater has been placed under the table where the top of the table is made from the wooden frame but wooden frame is not mandatory anymore as it has been replaced by other materials like plastic. What is a kotatsu used for? To understand the purpose of kotatsu, first, we need to understand the culture and designs of Japanese houses. Unlike Western or American houses, the Japanese houses are not well insulated. There is no central cooling or heating system has been found on most of the Japanese houses as they are not very feasible and expenses for the general population of Japanese. Hence, instead of installing the centralized heating system, the Japanese turned a sport into a source of warmth. This is when kotatsu was introduced. Today, kotatsu is not limited to the houses of Japan. Due to their popularity and comfortable, it is now equally famous in America and other countries, especially in Europe. kotatsu is easy to move, so it can be use over the bed as well. There is a misconception that kotatsu can only warm the upper part of the body as it is the only part which keeps under the table where the heat could easily go through the whole body. During the time when kotatsu was created, it has been considered that the whole body should get warmed that’s why there has been warm blanket included over the table which keeps the whole body warm all the time, not just the bottom. When you select the kotatsu online on Amazon or other stores, you will found different styles of kotatsu. Due to its popularity, it no more counted as a lower table to sit on the floor or place over the sofa and bed. Today, the kotatsu tables are also coming in the standard size of a table to keep the people warm while they are using a computer, eating food and studying etc. Originally the kotatsu is not made to sleep due to the heater under the table but today we do have a different style of kotatsu which can be placed over the bad and get warmed while sleeping. The main things which make kotatsu set different from each other in term of styles are the height of the table, a different type of futon. The fabric of the futon can change the whole look and even the purpose of using the kotatsu set. They are available in a heavy blanket, leather and even in a simple piece of cloth which is fill with cotton etc. In past, the kotatsu was available in standard size as people only use it to get warm while eating or playing games etc. But today, due to its different styles, the kotatsu is available in different height and size of the surfaces of the table top. So, when you are purchasing one, you must keep the main purpose of buying one e.g. are you going to use it for other purposes too other than just using it a table to warm the family. Once the futon is removed, the kotatsu can be used as a normal table and desk. Traditionally the height of kotatsu table is fairly low; about 16 inches or 40 centimeters. You can purchase kotatsu table without heater from Amazon. One can purchase the heater for kotatsu separately. In past, the Japanese use the furnaces and stoves with coal to heat the area under the table including blanket but today the kotatsu is available with electric heater only. The heater should be properly cover and enough high in term of height as one can accidentally burn the legs or even it could give serious burns. You can purchase kotatsu heater alone like table. 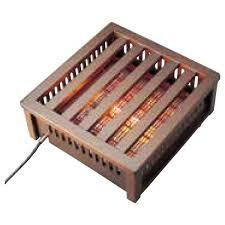 Using the kotatsu heater will save your lot of money if you compare the bill against your centralized heating system. Usually, the heaters come in 230V and 120V configuration. So you do not need to be worry about the voltage as the options available for everyone. The kotatsu futon is a thick blanket with and without cotton. It’s totally depending on the area you are living in as it is not very cold everywhere in winter. It is always better to purchase multiple kotatsu futons because this allow you to use other when one is dirty. The kotatsu futon is removable and can be wash in the washing machine. The instruction regarding cleaning futon comes along with the kotatsu set as the futon can be make from different materials. When you are buying a futon for kotatsu, ensure that you know its purpose as it will help you to decide that which should be the size of the futon. People use it for multiple purposes like only for sitting, using for sleeping and other preferences etc. In Japan, the handmade futon is also available. These handmade futons can be purchase from Amazon as well. They are expensive due to styling and artwork. The handmade futon is rare in the USA but still can be purchase online. Kotatsu is already popular in America but still, there are very few places like Amazon from where one can buy kotatsu at a reasonable price. The reason which makes it rare is not it’s less popular but the houses in America which already have the heating system. Amazon is a great place to buy kotatsu. Some people also placed their used kotatsu table on different classified websites including eBay. I suggest you purchase a new one from Amazon as it comes with zero faults. 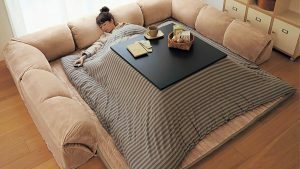 The kotatsu sets are not the only thing available on Amazon. You can also part its accessories or its items separately. For example, if you are making your own kotatsu table or planning to use your own blanket then you don’t need to purchase the complete set of kotatsu but only those items which are missing. Amazon has the option to filter the kotatsu set on the basis of size, height, and even weight etc. So, purchase the one as per your personal preferences. Keep in mind the uses for which you decided to have the kotatsu set at your home. How to buy a kotatsu set? The standard height of a kotatsu table is short as the Japanese have a culture to sit on the floor. So, as a Western person, it could be uncomfortable for you to sit on the floor or sitting on the floor with legs crossed etc. So, ensure that you know about this issue. If you have a comfortable place on your floor, then you do not need to be worry about. To ease this issue, you can always have an extra pillow for comfort. The customized kotatsu table could cost you a lot, so it is always ideal to purchase one which fulfills your preferences. One Amazon the tables are even now available in standard table size. If you are not comfortable to sit on the floor then you can buy zaisu along with your kotatsu. It is a floor chair which can provide you backrest while sitting on the floor. Futon types: Futons are available in a different material. If you have kids then you probably need to change it after some time. Kids can make it dirty easily. Make sure to purchase a futon for kotatsu which is not only easy to clean in the washing machine but also easily removed from the table. Other than above, you should also keep in mind the difference of voltage as in Japan; they use a voltage of 120V. We do use the same in the USA but if you are ordering from any other country which supports voltage around 230V and 240V other frequency then ensue to check them before you place the order. Why should you buy a kotatsu? The kotatsu use only 600W of electricity. That’s not it, having a kotatsu at home is really fun not only for human but also for the animals. Your cats and dogs will love to sit under the table in cold winter to keep them warm.